I t’s the little things in life. I finally have my knife rack up at my little workstation! 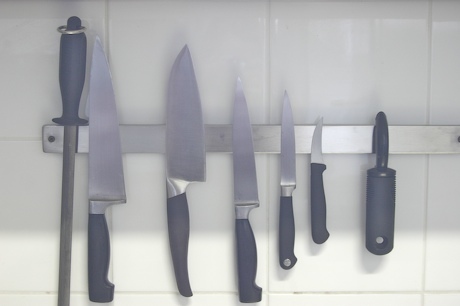 Clutter is the absolute enemy when you are trying to get a load of meals out, and being able to throw my knives up on the wall has been such a delight. And even the little spoons stick…it’s just great! Right now, I’ve got a purring pussycat sitting in my lap, while I type away. And I’m taking a moment to savor the little things in life.